As many a player, veteran and new alike, take to the field of battle one of the most popular and effective weapons, the ATGM, has proved a difficult enemy to overcome. As a tank formation commander, massed ATGM fire is a terrifying prospect. How then, does one deal with ATGMs quickly and efficiently? First we must understand the nature of the weapon system. Let’s have a look at the NATO forces first. The Milan with its 21 AT, 3+ FP, and 8”/20cm to 36”/90cm range is the primary ATGM of NATO— forces with the exception of the American and Canadian forces who use the TOW. 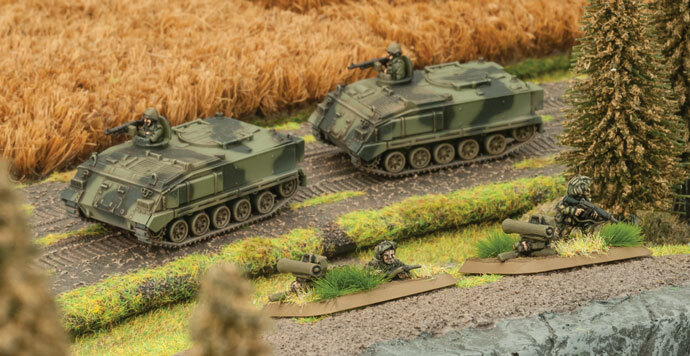 It’s an affordable add-on, as with most forces, it’s 2pts for two and can be added onto an infantry platoon or taken as an AT platoon by itself. The Brits favour the Milan weapon system and can field an abundance of them for very few points, not to mention their admirable skill rating. As for the Yanks and Canadians the have the TOW with the same stats as the Milan but can shoot up to 48”/120cm instead of 36”/90cm and a majority are vehicle-mounted. The infantry also have access to the M47 Dragon but it has a lower AT rating at 18 and a shorter range at 8”/20 to 28”/70cm. The other ATMGs available to NATO forces are the HOT and Swing Fire Systems. Both have the same stats with AT23, FP 3+ and a range of 8”/20cm to 48”/120cm. Last of all are the AA systems with the capability to shoot at ground targets— the blowpipe and the Canadian ADATS. The blowpipe is the weakest of the lot with an AT of 12, FP 4+ and a range of 16”/40cm to 32”/80cm. The ADATS, on the other hand is the most powerful with an AT of 24, FP 3+ and a range of 16/40cm” to 64”/160cm. The WARPAC forces have some decent ATMGs of their own. The Songster is AT 21, FP 3+, and range with a range 16”/40cm to 48”/120cm, can be fired on the move. The Spandrel with AT 21, FP 3+, and range 8”/20cm to 48”/120cm gives us the option to fire on enemies who are rapidly closing in on you. The Spandrel, with AT 21, FP 3+ and range 8”/20cm to 48”/120cm is another effective option. Infantry teams have access to the Spigot with AT 19, FP 3+, range 8”/20cm to 40”/100cm, and ROF 3. Last of all is the Spiral with the highest anti-tank rating of any of the WARPAC ATGMs at 23, FP 3+ and range of 8”/20cm to 56”/140cm. So how does one successfully negotiate the battlefield without each and every tank being torn to shreds by ATGMs rockets? 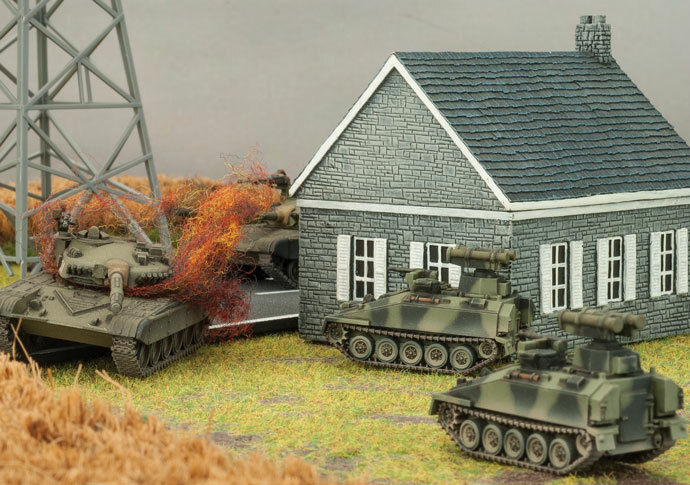 First, we must consider deployment and placement of our units—especially the tanks. The trick here is to take a recon element, like we discussed in the last lesson, to take advantage of the Spearhead special rule to extend our deployment zone, hopefully denying the enemy some key terrain and giving us a good path for our tanks. Utilising the recon Spearhead we can now deploy our tanks with some infantry in support in some cover and concealment—in case we don’t get first turn. We must keep in the back of our minds the minimum range for ATGMs, and plan to to close this distance as quickly as possible, forcing the ATGMs to move or pass a skill check to blitzback into range. All this is easier said than done. We won’t be able to use a Dash as this will bring us just within the minimum range for the ATGM, however with the Spearhead, we should be within 16”/40cm of the enemy so we can effectively move 10”/25cm and combined with a Blitz move order this can be up to 14”/35cm with our tanks. To close the distance, this brings us under the 8”/20cm, but this can be tricky depending on the terrain, and of course where the ATMGs are deployed. This is most effective against infantry ATMGs, as most infantry, unless mounted, will be dug in. When the tanks are finally in position, they should be focus-firing on the ATMG teams to eliminate them first. Most tanks have Brutal for the main gun so forcing rerolls on infantry will hurt. Another method is to use massed MG fire to ether pin or destroy the team. If Artillery is available, priority should be given to pinning or destroying infantry ATGM teams. Vehicle-mounted ATGMs often prove more of an obstacle especially the ones with the Copperhead and Sidewinder rules which, even after firing, remain gone to ground. If the enemy has few or no tanks, ATGMs should be the priority targets. In summary, we deal with ATGMs by closing the distance to make their return fire ineffective and keep our tanks safe. Hopefully this lesson will help you move forward and take the objective without losing too many of your tanks.